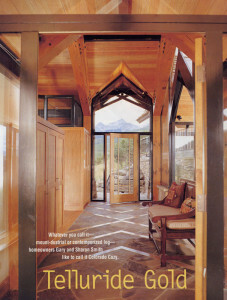 In 1997 Jerry Ross designed my home in Aldasoro Ranch near Telluride Colorado. Jerry not only did a great job on the design and overseeing the construction, but he also made the process easy for us to get exactly what we wanted. Jerry takes personal interest in making sure that every aspect of the project is perfect and continues with his concern for my home well after the job is done. Our home is now over 10 years old now and we love it more than the day we moved in. The design has stood the test of time and it has been a problem free and efficient construction. I would recommend Jerry on many levels both for his professional acumen and as an honest and caring person.